Instant flashback. You know you love a good Rice Krispies Treat (or ten). 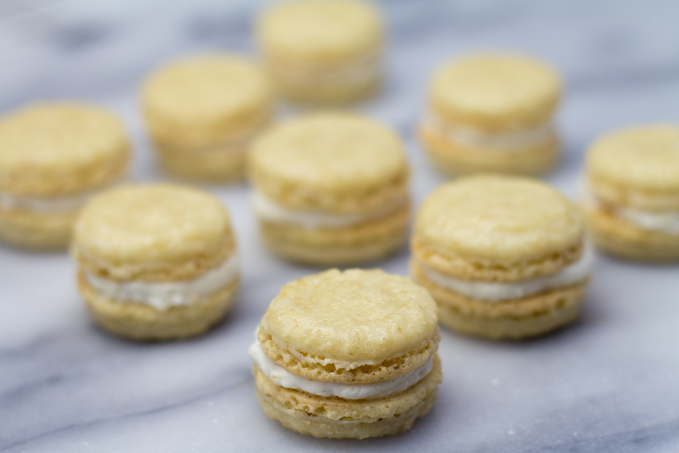 One of those classic snacks that you can’t stop eating, and will never stop loving, I decided to try to squish it into the ever-so-popular, slightly more delicate, macaron. 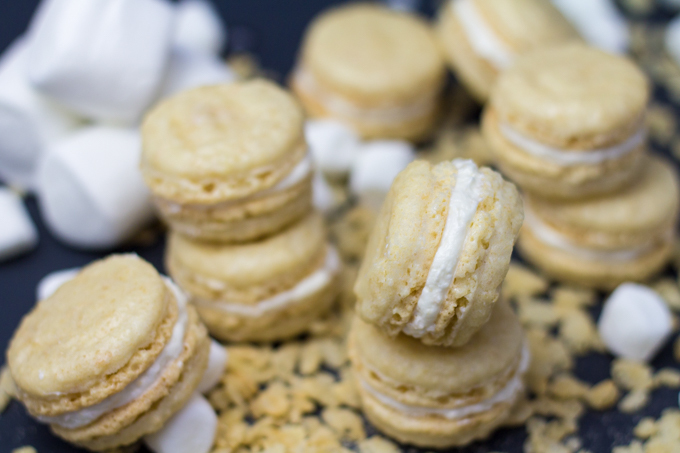 Rustic and absolutely delicious– Rice Krispies Treat Macarons have arrived. Macarons are one of those super-intimidating sweets that everyone loves to enjoy, but nobody really wants to make. They have this sort of aura surrounding them of doom and gloom for bakers. I put together a pretty extensive guide to macs a while back on our Macarons 101: The Beginner’s Guide. Go check that out if you are serious (or even just don’t want to burn the house down – likely out of rage) about mastering these pups. 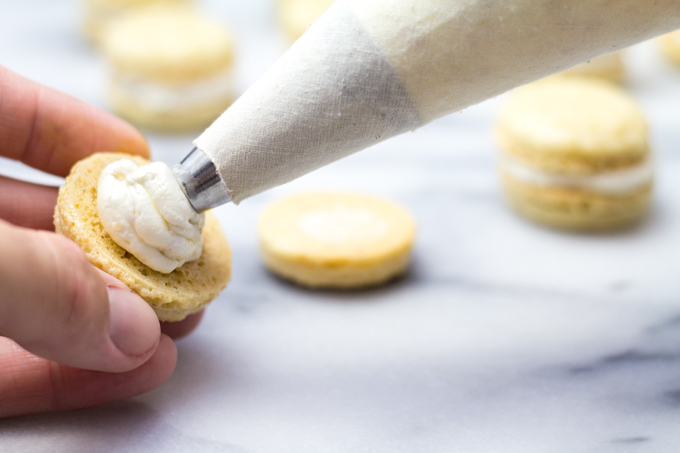 These macs won’t be super-smooth like your normal Pâtisserie E. Ladurée pipe. We’re going to go all 8-bit elementary school, grinding some serious Rice Krispies into the shells. Gimme that crunch, or give me death. That’s how it goes, right? An added bonus of these shells being rustic is that you can be a bit more lenient with your technique. These are a great macaron recipe to start with for that exact reason (read: because they are DELICIOUS). 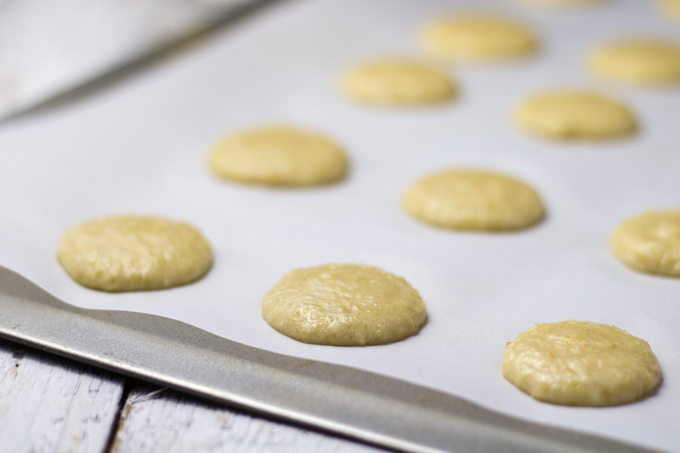 I’ve taken a bit of time to create a FREE downloadable macaron piping template that you can print out and slide straight under your parchment paper for perfectly uniform cookies every time. 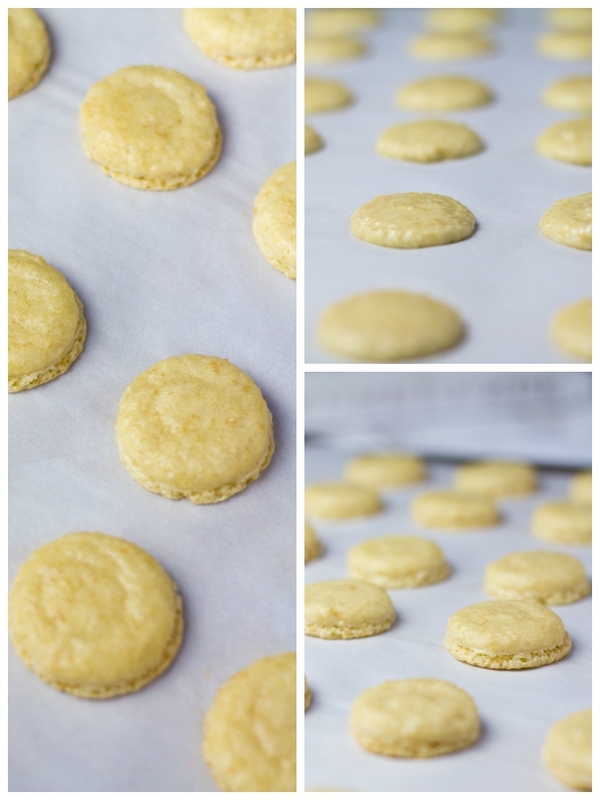 You can download that from the Macarons 101: A Beginner’s Guide post. You’re probably gonna want to save that classic mac with raspberry buttercream recipe while you’re there. If you are a total nerd, check out this read about finding the perfect macaron shell recipe ratio. I’ve tried to experiment with different proportions, and this one is still the best. 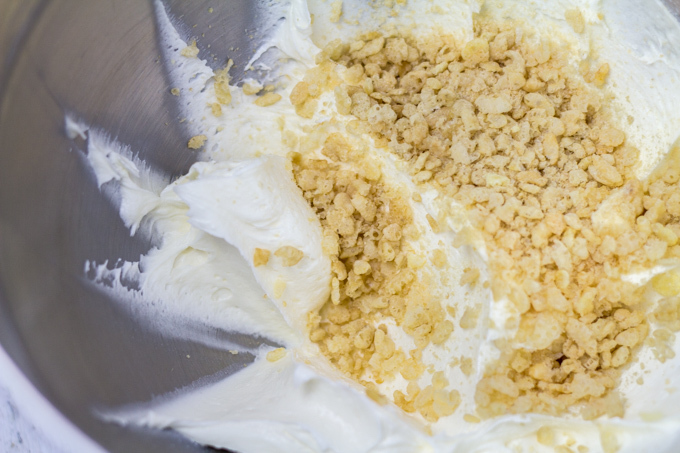 Between the Krispies shells, we are going to use good ol’ marshmallow fluff as a base for the buttercream. I don’t really won’t to admit how much of this was eaten before the macs were filled. Let’s just say that I can attest that it goes well on graham crackers, on top of Oreo’s (what? they were Thins. Don’t judge.). and certainly straight out of a (large) spoon. With the classic recognizable macaron textured feet and classic taste of a perfect made RKT (rice krispies treat for y’all out of the fatty loop), these are officially 1st place winners in my book. I would even probably go as far as saying the flavor and texture would be in my top 3 macs of all time list. Last year’s Parisian tastes included. You’ll probably need to compare these to the world’s best RKTs ever (recipe HERE). You know… just to be sure. 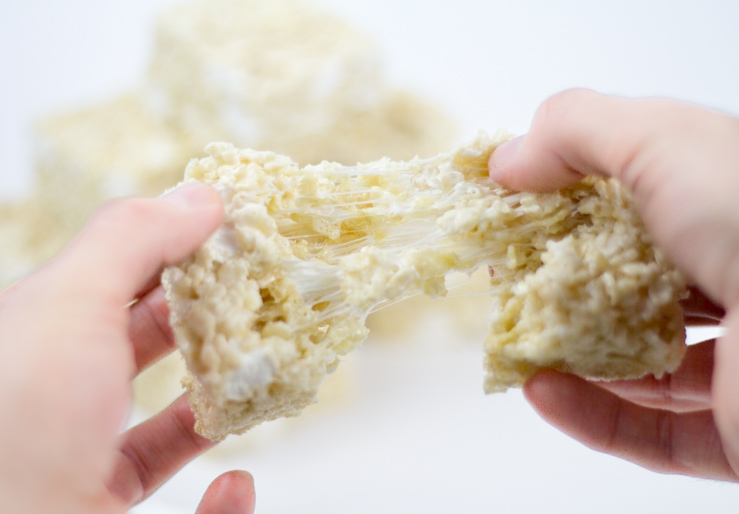 Flashback to the World’s Best Rice Krispies Treats – Click the photo above for the recipe! These just totally opened up a whole new world of macarons for me. You very well may see your fav childhood cereals pop up again in this sweet, sweet handheld love form. Suggestions for cereal requests are perfectly acceptable reasons to send us a quick comment or email. Be sure to follow along on our e-mail list to get first dibs on the nibs! 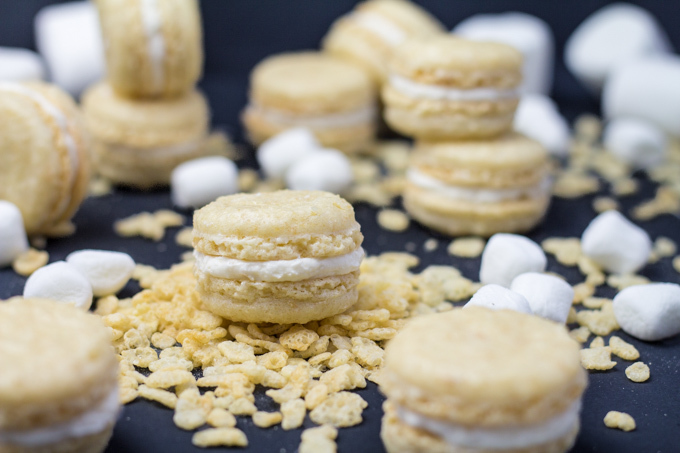 Lightly toasted Rice Krispies ground into the vanilla-almond based shells, filled with a light and fluffy marshmallow fluff buttercream. These are what dreams are made of, y’all. _Review our Macarons 101: A Beginner's Guide post if you want more details on the how and why's of macaron making. In a food processor, combine almond flour, powdered sugar and Rice Krispies cereal. In a very clean mixing bowl with whisk attached, add egg whites and optional cream of tartar. Mix on medium speed until foamy. Slowly add granulated sugar and continue mixing until stiff peaks form. In three batches, fold carefully in almond meal/powdered sugar/Krispies mixture. It is important that you FOLD and NOT MIX. Please visit our Macarons 101: A Beginner's Guide post for detailed instructions on folding, etc. Fold until a ribbon lays on itself and disappears after about 30 seconds. Using our FREE printable macaron piping template from our Macarons 101 post, pipe 1-1.5" macaron shells. Using this template, you can pipe uniformly. That post will also explain exactly how to pipe, if you need some guidance. Drop the sheet pan on a hard surface a few inches above several times to eliminate any possible bubbles in the piped pastry. Allow the cookies to rest at room temperate for 30-45 minutes. 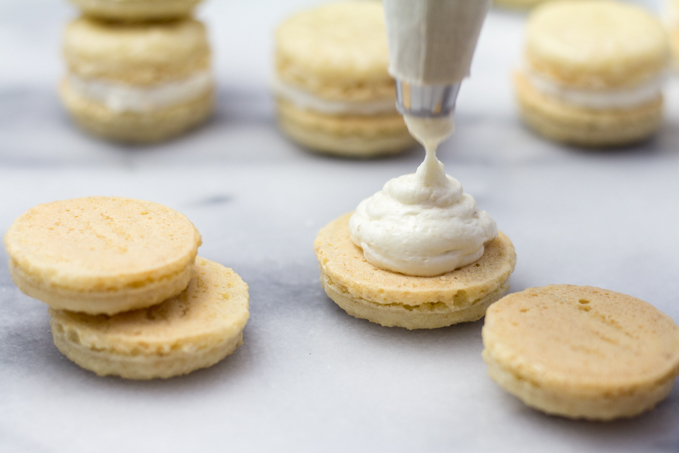 This step is critical to forming the pieds, or feet, of the macarons. Pre-heat oven to 285 F.
When oven is ready, transfer baking sheet (be sure you have removed the piping template) to oven to bake. Bake for 18 minutes. The macarons should not be golden at all. You want them to remain chewy and sot in the center. This time may vary very slightly with various ovens. Remove and cool completely on sheet pan. Cream butter in mixer. I prefer to use a BeaterBlade attachment, which scraps the bowl while mixing. Add marshmallow and continue to beat on medium speed. Add in powdered sugar in batches and mix well until smooth. Mix in vanilla and crushed Krispies. Transfer to piping bag. I prefer to use no tip for this filling. My bag has a ½" opening. Very carefully remove shells from baking tray, lifting from one side and pulling paper away. Ratios for recipe based on data from Not So Humble Pie. would love to see next. Can’t wait to try these! How much should I pulse in the food processor? 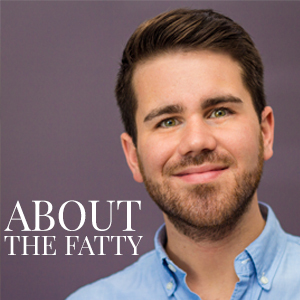 Should it be a little chunky or a similar size as the almond flour particles? Personal preference, really. I usually give it 4-5 pulses. Good luck! Let me know how it goes. I expect a dozen of these bad boys to appear on Matt’s porch on Monday. Make that two. These are my kindof macaron! And I could probably eat that buttercream with spoon. Looks soooo good. Thanks! Def addictive. Way too easy to make. Dangerous! That filling is sooooooo good! Def going to incorporate it into some other sweets. Oh, are you kidding me right now Phillip?!?!?! I have an RKT obsession and I need these in my life, like, two weeks ago. because i insist on being the last one to do everything, i haven’t made macarons yet. when i finally do, this may very well be the batch i try! These are perfect to start with! Since the Krispies make the shells a bit less delicate and smooth as classic macs, you have some room to screw up. Good luck! Tag us if you make some and shares the pics on social media. Apple Jacks is a great idea! 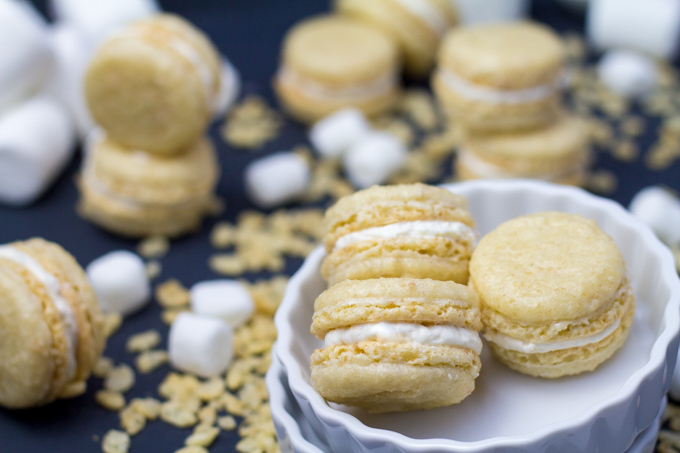 Jenny from Picky Palate did some Frosted Flakes macs a while back, but I may have to take my own twist on them soon. Thanks! Hope it goes well! Let us know. You evil culinary genius, you. These are brilliant! Coming from the Queen of it all! 😉 — Thaaaaanks!